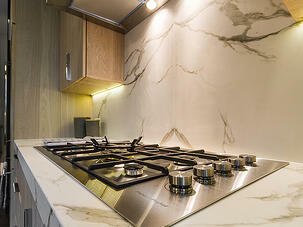 When it comes to real estate, kitchens are the most important room in a home. 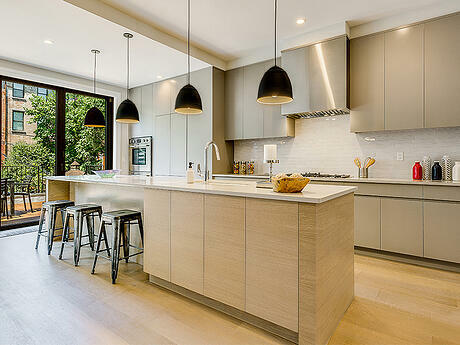 Not only do we spend an abundant amount of communal time in the kitchen — earning it "heart of the home" accolades — but the kitchen is also the site of many residence's most expensive equipment, fixtures and finishes. It's no surprise that homes that can boast about their "luxury," "professional" or "chef's" kitchen sell faster than those that can't. 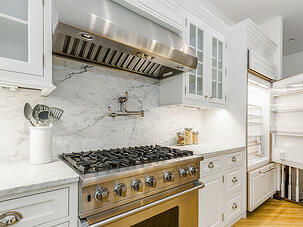 And, many kitchen upgrades earn more bang for their buck than updates in other rooms. 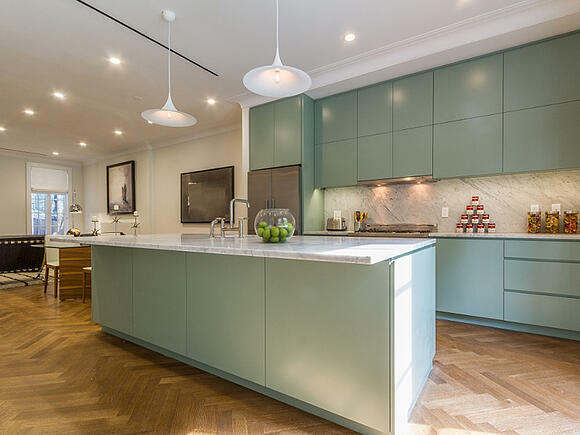 While, of course, we're all for sustainable, energy-efficient interiors, in this case when we say "green," we're referring to the rich array of greenish and bluish hues that are dominating the kitchen décor landscape. Forget the olive drab of the 1970s, today's greens are saturated, sophisticated and surprisingly neutral. 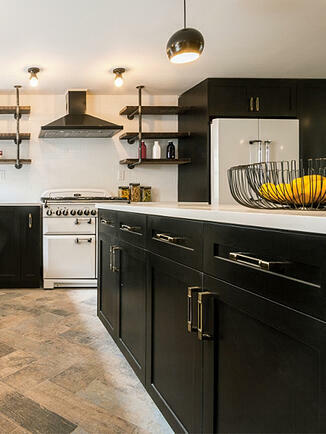 Punctuating a kitchen with a forest or emerald green can bring a subtle outdoorsy vibe to the kitchen, and green tones play nicely alongside a wide array of stone countertop looks. 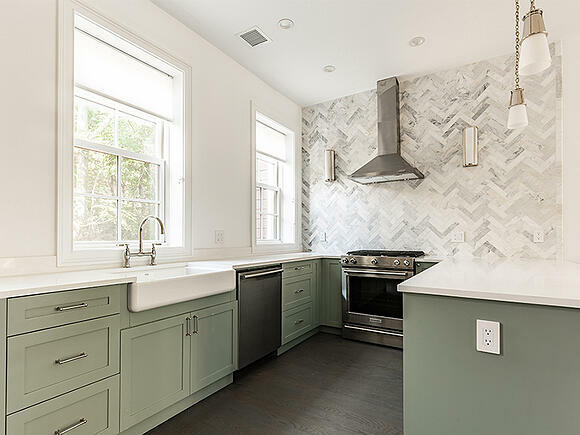 At our lovely Jersey City home at 206 8th St., gorgeous sage cabinetry adds an organic depth to sleek white countertops and tile, while a few doors down, at No. 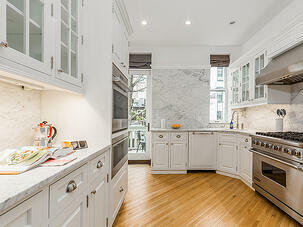 212., calming celadon cabinets blend seamlessly with the leafy trees just outside the kitchen windows. 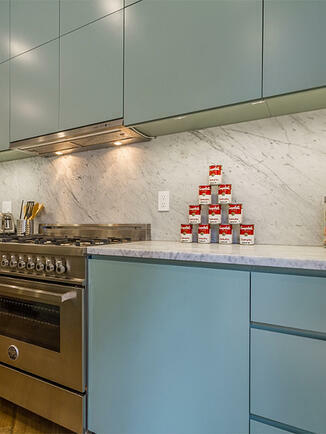 Perhaps nearby Fort Greene Park was the inspiration for the mint-colored kitchen installed at 266 Clermont Ave. in Brooklyn. 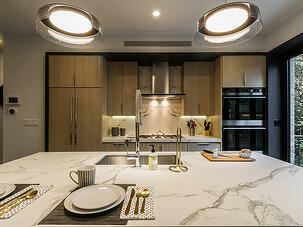 Green cabinetry isn't the only way to add a bit of nature to the kitchen. 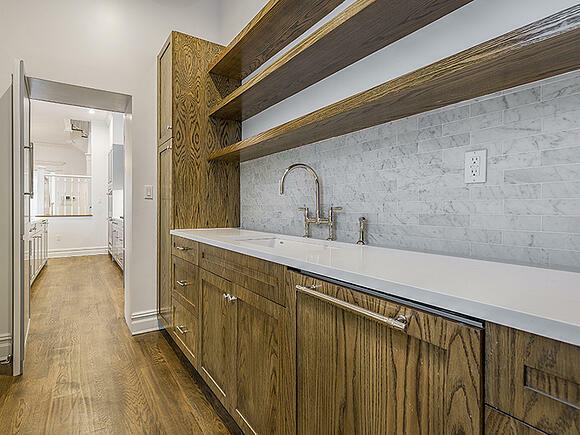 We're wild about natural wood accents for their ability to take the sterile edge off of kitchens, which are typically filled with cold metal and stone. 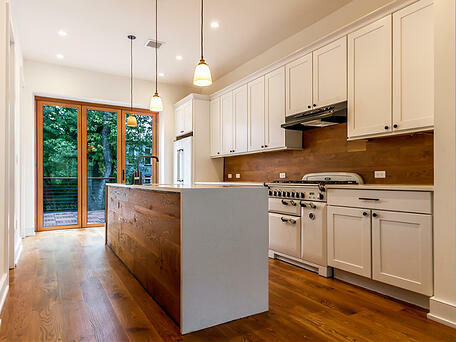 In our Stuyvesant Heights home at 513 MacDonough St., for example, wide-plank wood is used in the backsplash and the breakfast bar kick panel, rooting the open cookery to the rest of the great room and to the lush backyard just outside the NanaWall doors. 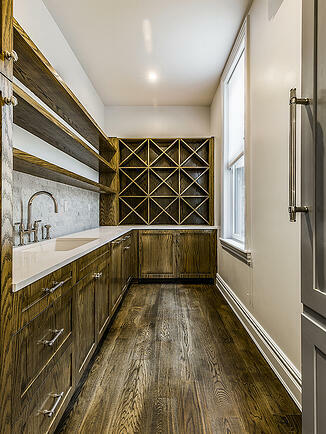 Reclaimed wood joists create a cozy canopy effect, accentuated by a unique range hood cover and rustic barn doors, at a Bed-Stuy townhouse at 224 Bainbridge St., while in Harlem's Striver's Row, a spacious wine room and wet bar gets the natural wood treatment. 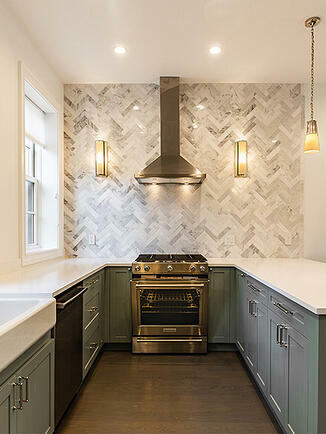 With durability and timeless style, marble and other stone that imitates marble veining are a kitchen trend that may never go out of fashion. Whether deployed in massive slabs on a waterfall island or in textural mosaic backsplash tiles, we're mad for versatile marble looks. 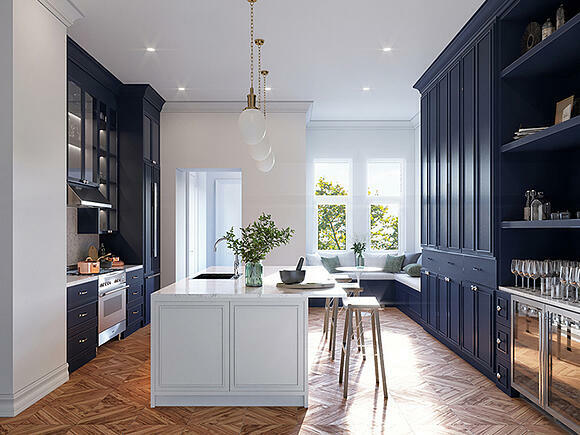 Case in point, at 10 Polhemus Pl., a grand Park Slope townhouse filled with architectural detail, luxurious marble climbs nearly all the way up kitchen walls, adding a fresh detail to a classic cookery. 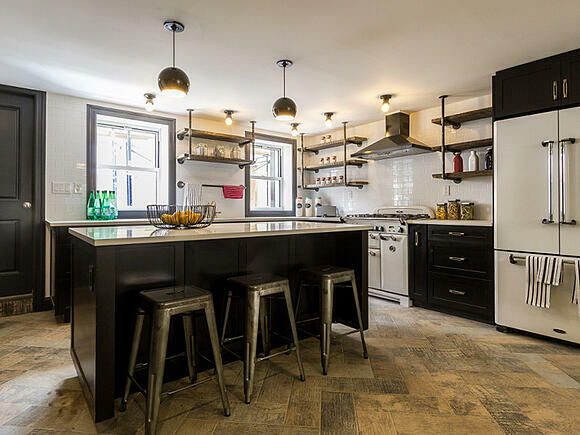 Book-matched stone adds drama and elegance in kitchen and wet bar backsplashes in Bed-Stuy's 10 Hancock St. Versatile veined Quartzite, meanwhile, goes light and airy in a Dixon Projects SoHo renovation, and dark and moody in a historic Harlem row house. 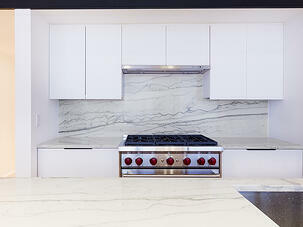 Whether used for prep space or breakfast counter seating, islands are among the most coveted kitchen elements. 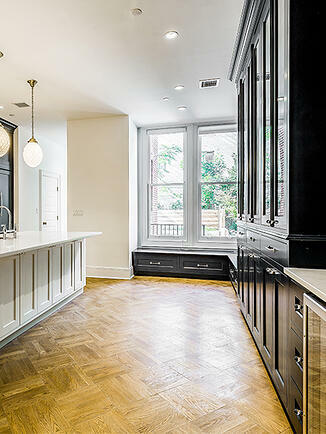 The island at 296 Manhattan Ave. provides a front-row seat from which to view the black-and-white kitchen's distinctive industrial touches. 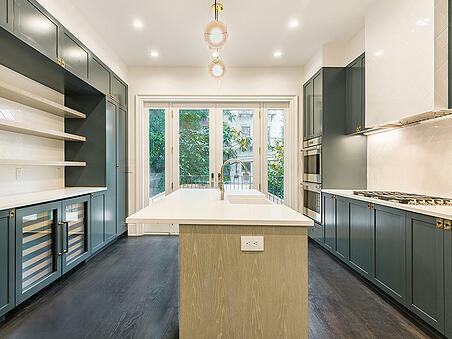 At 48 Downing St. in Clinton Hill, a long, long Caesarstone island does quadruple duty housing cabinet space, a sink, dishwasher and seating for three, while just a few blocks away, the massive island at 272 Lafayette Ave. capably bears the brunt of housing storage space in a kitchen where upper cabinetry was eschewed in favor of retaining millwork and architectural detail. Living up to their reputation as the home's gathering place, kitchens are obligated to provide comfortable seating for casual dining and chatty conversations. 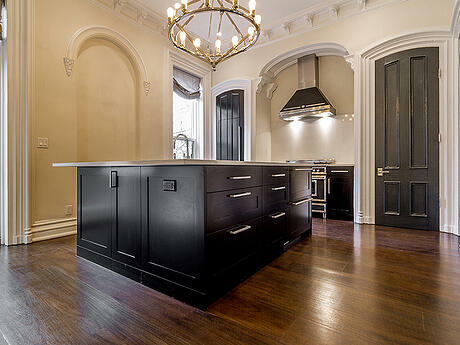 While island breakfast bars are the norm, a beautiful banquette ups the kitchen coziness factor. 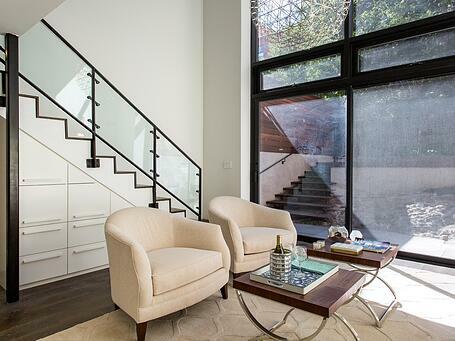 We're especially fond of the corner bench seating at 36 Hamilton Terrace in Hamilton Heights. 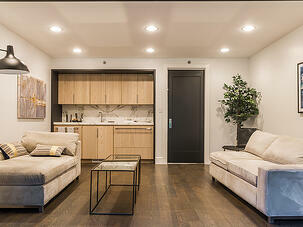 It has handy storage underneath, and its window position makes it an ideal vantage point for lovely backyard views. 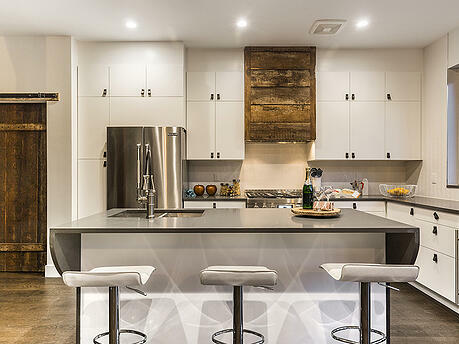 If you're looking to embrace these kitchen design design trends, Dixon Leasing and Dixon Projects offer homes and design services to meet your needs.